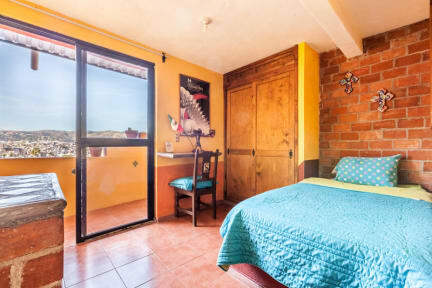 Une grand vue panoramique et notre traditionnel et fameuse petit djeuner mexicain tattendre Hostal Casa de Dante ; dcouvre pour quoi centaines de voyageurs dcident monter 165 tapes pour se rester chez nous. En plus : Wi-fi gratuit, cuisine pour htes, art traditionnel, information touristique et tours des amies et culture ! Lovely place, amazing staff, delicious breakfast and beautiful view from the rooftop. I will definitely stay there again! Such a wonderfull place. The staff at the reception was very helpful and professionnal. They even spoke to us in french (our mother thong). The breakfast in the morning was amazing. The cooks were so welcoming and kind. The Hostel is very well located and easy to find. Each day the room was cleaned. We felt like in an Hotel. Only little downside is the noise. Lots of people were partying hard on the terrasse. I know lts an hostel but still. Maybe more strict rules on this could help. Although it is a solid 15minute walk to the center and a serious climb up the stairs back to the hostel, the view from the terrace is definitly worth the walk/little exercise. The dorms are very clean and cozy. The whole building is very cozy and beautifully done for that matter. The included breakfast is amazing! One of the best we had so far. The staff staff is also very friendly and helpful. For example we arrived the morning of our first night and we we’re offered breakfast. Accueil très chaleureux, le personnel est au petit soin pour vous rendre le séjour agréable dans cette ville magnifique, un très bon moment. 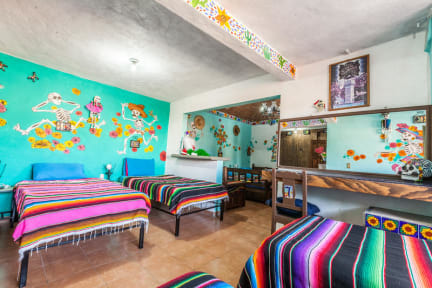 One of the best hostels I was in a one month trip in Mexico. Great service and beautifull view from the terass on the mountains and the city of Guanajuato. Cadre magnifique, une vue sur Gaunajuato à vous couper le souffle, personnel très accueillant, très propre. Point négatif, aucune insonorisation des chambres à l'étage et toit en taule. Prévoir des boules quies pour les chiens hurleurs et les orages ( impossible de rester dans ma chambre sinon par forte pluie). Point positif, le cuisinier est un vrai chef, des petits déjeuner époustouflant et délicieux!